Gold Nylon Blend Squeegee, 4"
Our squeegees offer 3 rounded corners and one 90 degree sharp corner to help you with any shape or application challenge. 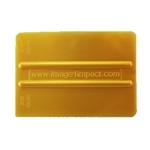 This 4” squeegee also offers a softer side and a harder side so it is perfect for any application needs you have. This squeegee is best suited for those who prefer a softer feel squeegee. Great for conforming around curved surfaces and vehicle wraps.